Family vacations on a budget. One of the most expensive parts of a vacation is lodging. When you visit Disneyland you have many choices from which to choose. You can stay in a Disneyland hotel or you can choose from any number of chain and locally owned hotels in the area. Disney's Grand Californian Hotel & Spa (rooms rates ~$470 per night) If you would like to stay at the most expensive Disney hotel, then the Grand Californian Hotel & Spa is for you! Enjoy a world class spa, themed pools and slides, & easy access to Downtown Disney and California Adventure Park. You will have a private entrance into California Adventure Park. A stay at Disney's Grand Californian Hotel & Spa will allow you access to Extra Magic Hour. 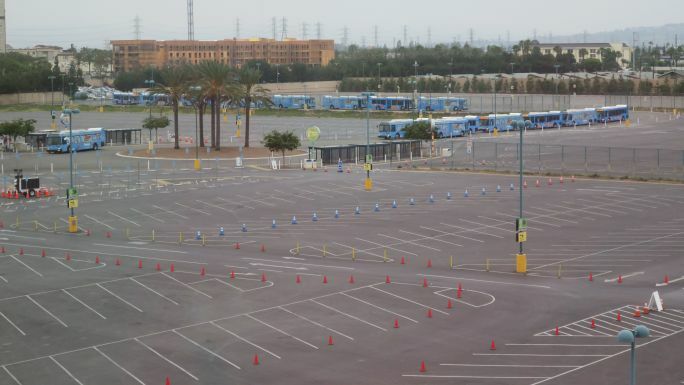 Extra Magic Hour is where Disney hotel guests can have early entrance to Disneyland OR Disney's California Adventure one hour before it opens to the public on select days. Extra Magic Hour is ONLY for Disney hotel guests. This is not to be confused with Magic Morning. Magic Morning is for guests who: purchase a valid 3+ day theme park ticket in advance of Resort arrival OR those who purchase a Southern California CityPASS online, or at the Main Entrance Ticket Booth. Magic Morning allows early entry to Disneyland one hour before park opening on select days. Note: Only guests who stay at a Disneyland hotel will have early access to Disney's California Adventure theme park. Disneyland Hotel (room rates ~$418 per night) The Disneyland Hotel is the mid-range priced hotel of the three Disneyland hotels. It is not as close to theme parks as the Grand Californian Hotel & Spa. You are located near Downtown Disney & the monorail stop. You will have access to Extra Magic Hour that will let you enter Disney's California Adventure OR Disneyland one hour before opening to the general public on select days. Disney's Paradise Pier Hotel (room rates ~$269 per night). This hotel is the least expensive option of Disney hotels. You are located further from the monorail stop in Downtown Disney than the other two hotels. You will have access to Extra Magic Hour that will let you enter Disney's California Adventure OR Disneyland one hour before opening to the general public on select days. Wow! Disneyland hotels are expensive! Needless to say, we did not choose to stay at a Disney hotel for our visit to Disneyland. The only benefit I could see for staying at a Disney hotel was early morning access to Disney's California Adventure Park. 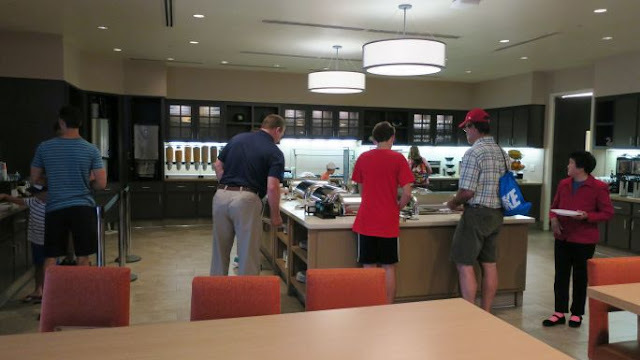 We decided to stay at a Disney Good Neighbor Hotel instead & saved about $900 for a 4 night stay. 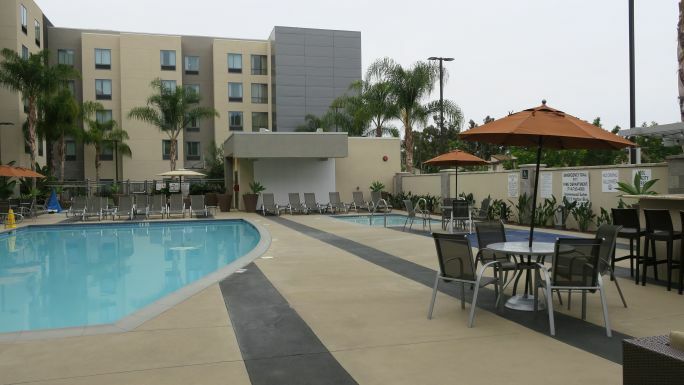 You have many choices of nearby hotels from which to choose when you visit Disneyland. Unlike Disney World where the "other than Disney hotels" are a car drive away, Disneyland has many lodging options within walking distance. 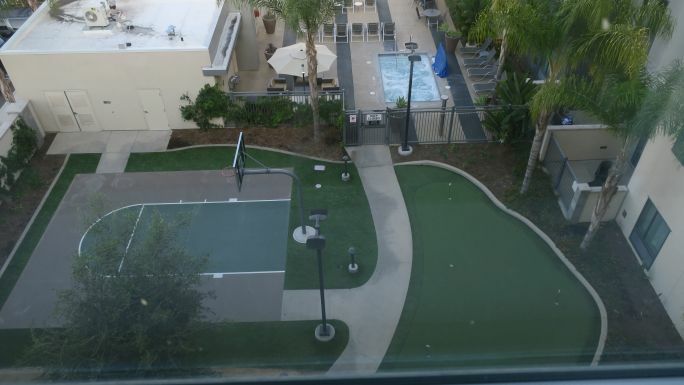 You are within walking distance to Disneyland's Toy Story Parking lot. It is literally behind the hotel. It might have taken us 8 minutes to get from our 5th floor room to the Toy Story parking lot. We caught the bus from the parking lot & were at Disneyland in less than 15 minutes even with traffic. You are within walking distance to Disneyland's entrance. One night we decided to walk to our hotel from Disneyland and timed it. It took us 25 minutes to walk from Disneyland gate to Homewood Suites Anaheim Convention Center. The walk was pleasant and we felt safe. The rooms are spacious & comfortable. Our studio 2 queen beds room featured a sitting area with a sofa, chair, & TV. There was a desk and chair between the sitting area and kitchen. 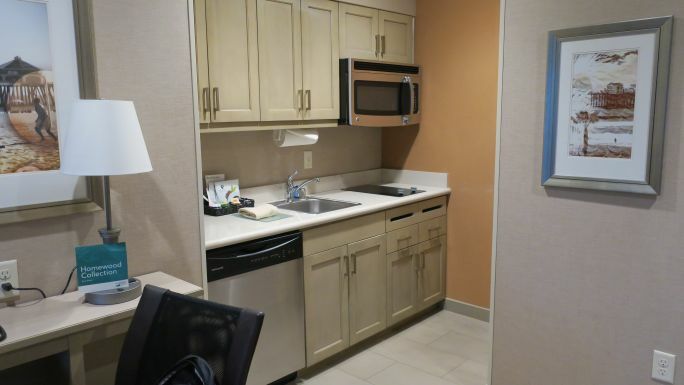 The kitchen had a full size refrigerator, cook top, microwave, and dishwasher. There was a safe in the room. 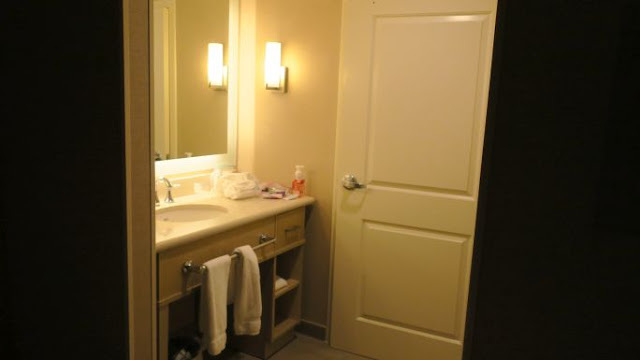 The bathroom area was split with the vanity located outside the toilet and shower room. I really like this so I can get ready in the morning while others are showering. 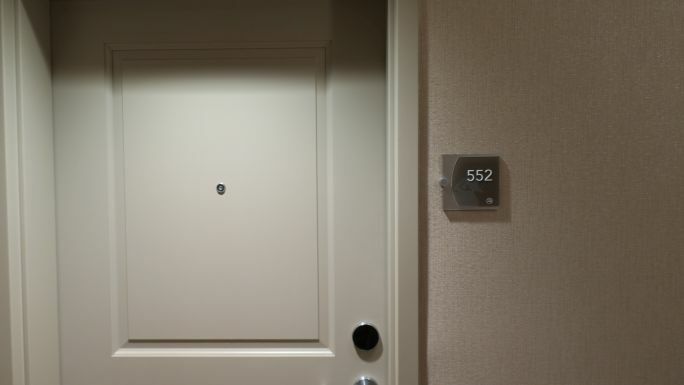 We stayed in Room 552, on the top floor. The refrigerator is behind the wall on the right side. A large closet is located to the right of the picture. The amenities are fantastic. Just wish we had more time to enjoy them! We spent most of our time at Disneyland. Nice pool & hot tub! 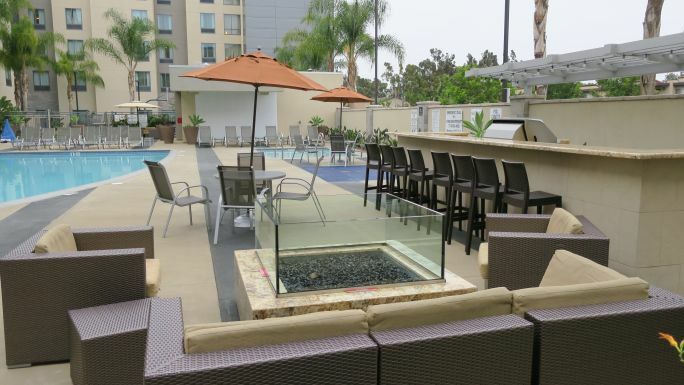 An evening by the fire pit would be welcomed on cool Anaheim evenings. Breakfast was plentiful with lots of choices that alternated daily. I also liked there was plenty of seating in the breakfast area for the number of guests at the hotel. There is seating available out by the pool as well. 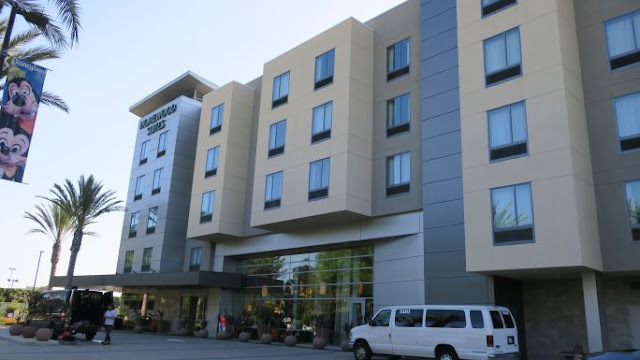 The only negative thing I can say about the Homewood Suites Anaheim Convention Center would be parking. Self parking costs $18 per night. While I do not like having to pay to park at the hotel, it is still less expensive than parking in the Disneyland Toy Story parking lot next door which is $20 per day as of June 2018. When I first booked the Homewood Suites Anaheim Resort Convention Center my budget was screaming in pain! Four nights in a studio 2 queen cost $1,047 - that was $261 per night. A little more than I wanted to pay, but still much less expensive than staying at a Disneyland hotel. IMPORTANT hotel booking tip: Never reserve a hotel room using the pay now feature, always book with easy cancellation. I know, when you book the hotel the pay now rate is appealing but it has been my experience that room rates drop. Obviously this will only work if you book far enough in advance to watch the rates. If you are booking the hotel last minute then by all means, pick the least expensive rate. I booked my June hotel stay in February and chose the easy cancellation option. The rate in February was $1,047 for 4 nights. Between February and June my room rate dropped three times. Each time the rate dropped I cancelled my original reservation and re-booked at the lower rate with no cost. I just checked the hotel rate from the hotel website and when the rate dropped I saved money. So how much money did I save? I ended up paying $651 for 4 nights in my studio 2 queen room. Yep, that's right I saved $396 from when I originally booked the hotel in February. Remember, book your hotel early using easy cancellation and check the rates frequently to see if they drop to save the most money! 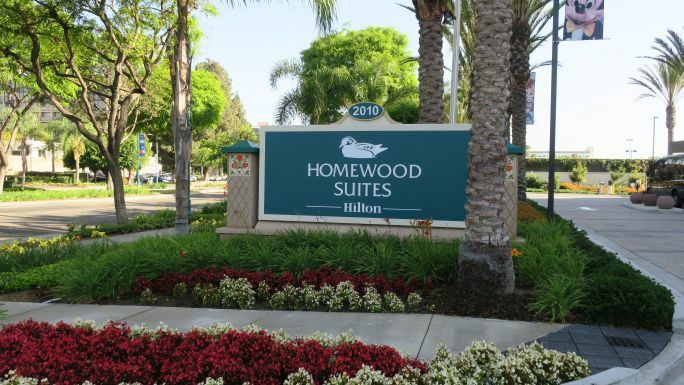 I highly recommend staying at the Homewood Suites Anaheim Resort Convention Center. Enjoy your stay! May God bless you wherever you choose to go. Welcome to 1GR8VACATION! 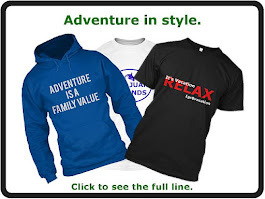 I created this blog to help families plan their next vacation, while maintaining a budget. I am the proud mother of a teenage son, wife to a great husband, and a middle school teacher. We have been blessed to visit many great places on our journey. I am excited to share with you some travel tips as you plan your next family getaway. The Hill Country of Texas - A Fun Family Adventure! You CAN find it in Canton, Texas! A Day in Las Vegas! 1gr8vacation 2017. Ethereal theme. Powered by Blogger.